No matter what challenge we face, we retain a basic human need to belong, have an identity, and feel capable and useful. We all deserve the opportunity to engage in meaningful involvement. We all want to feel good. 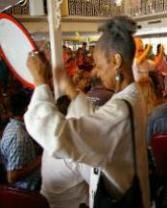 As a drum circle facilitator, Deke Kincade celebrates the intrinsic worth of all participants. With patience, skill and insight, he ensures the fun and pleasure of drumming is accessible to everyone, even the most rhythmically challenged! Playing drums since grade school and facilitating drum circles for nearly 20 years, Deke has the passion, creativity and intuition to help participants connect with each other and enjoy the power or rhythm and music. For more info about Deke's background including recording, performance and availability for instruction, click the link below. "I was worried I wouldn't know anyone. By the end, I knew everyone!" "I never believed we could do it. Boy, was I wrong!" We really listened to each other. Everyone mattered. Everyone got it and we sounded great together!" "I have observed Deke in many situations and have been impressed with his ability to communicate . . . he is very sensitive to changing acuity and cognitive ability and adjusts his approach to best suit (our residents') needs. The residents talk about Deke and his presentations for days . . .I highly recommend Deke. . ."
Dedicated to the people of Baro. Please share. Life has a rhythm, it's constantly moving. The word for rhythm ( used by the Malinke tribes ) is FOLI. It is a word that encompasses so much more than drumming, dancing or sound. It's found in every part of daily life.